This weekend my parents were nice enough to send me home with a good portion of leftover corned beef, which I decided to experiment with rather than making the sandwiches the leftovers were intended for. The result? Sunday morning Corned Beef Benedict. The boyfriend and I are big on breakfast at home over the weekend, but I woke up on Sunday with little to work with. There were only three eggs left, no bacon or sausage or vegetables; I had two options: go shopping, or work with what was in my kitchen. So I toasted up two slices of rye bread and warmed the leftover corned beef in the oven. I topped it off with a poached egg, and voila! Corned Beef Benedict. I was working with what I had, but next time I’ll be sure to add some Russian dressing and Swiss cheese – then we can call it Ruben Benedict. 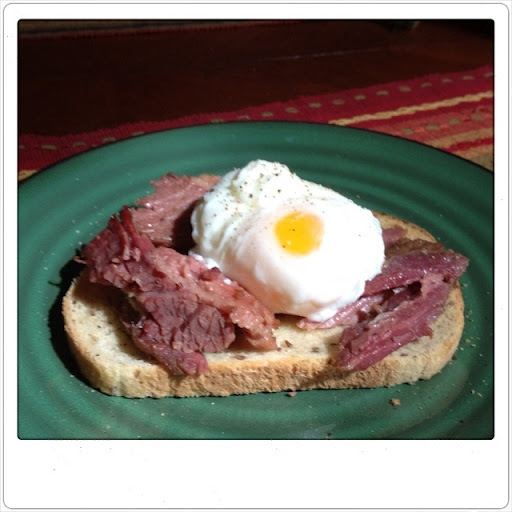 This entry was posted in breakfast, corned beef, Foodie, leftovers by ChristinaDoes. Bookmark the permalink.